How long is the winter season in Hakuba? Officially most resorts open Dec. 1 and close at the end of “Golden week” (the first week of May). Snow conditions vary but are typically at their best from mid December to late March. It is possible to be riding powder as early as late November and those bluebird days in April are perfect for cruisers, park and backcountry hikes. How close is the lodge to the ski hills, bars and restaurants? With Happo’s main gondola less than a 5 minute walk and one of the main shuttle bus hubs right outside our front door, you’ve got easy access to all the resorts in the Hakuba valley! There are also plenty of restaurants, bars and all-important onsens nearby. Is there an Onsen in the lodge? No. However, there are a few within walking distance and over a dozen that can be reached by a short drive. If you don’t have a car, sometimes you can arrange a ride from the lodge. Do you have any discount lift tickets? How can I rent gear? We have some quality (but limited quantity) snowboard gear for rent at the lodge. *If you’re planning on renting during one of the peak times (Christmas, New years, Chinese New Years etc. ), it’s a good idea to reserve your gear in advance. How can I arrange ski or snowboard lessons? We can arrange lessons for you at the lodge or direct you towards Evergreen Outdoor Centre. They offer lessons as well as guiding services in both Japanese and English and are located near us. Check out the link for more details; http://www.evergreen-hakuba.com/ or call Evergreen at (0261)72-5150. For Guests skiing at Goryu/Iimori and Hakuba 47 there is the excellent Hakuba snowsports staffed with all professional instructors. For private lessons they will pick you up at your accommodation and for group lessons it’s an easy shuttle bus ride away. We get excellent reviews on the tuition standards for these guys! Can I make International calls from the lodge? Yes. If you have a skype account we have a computer at the front desk with a skype phone that can be used for international calls. Yes, you can either rent a phone at the airport. Softbank provides this service at Narita, Haneda, Centrair and Kansai airports. 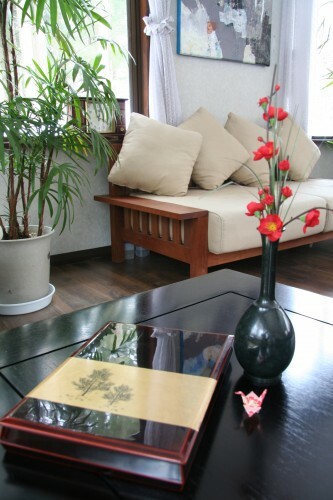 After your stay you can drop it off at the airport or send it by post to softbank. Another option is to buy a SIM card. Until recently this wasn’t possible in Japan but a company called B-mobile has just started doing this. Yes. We have high-speed fiber optic internet. You can use wireless or our desktop free of charge. After booking your room, we ask that you pay a 20% deposit. This can be paid by online credit card payment or buy bank remittance (furikomi). The rest can be paid by bank transfer a month before arrival. We usually use Ozforex which offers rates up to 5yen/dollar better than the high street banks and involves a domestic transfer to our Ozforex account in any of the following currencies – AUD, USD, GBP, HKD, SGD, CAD, NZD. * For our online payments we use Paypal. It’s a reputable service that is very secure and easy to use (almost anything you buy on ebay for example uses this). If you choose this method, you’ll receive a mail from Morino lodge that will connect you to the Paypal sight and walk you through the process. You don’t have to register with Paypal to make a payment. There is a 3.4% service charge when paying by credit card. Yes. The 20% deposit will be held in case of cancellation. For cancellations 60 days prior to check in date, all funds are forfeited. Can I get a pick up once in Hakuba? Yes. Once you know your arrival time in Hakuba, notify us by email or phone or you can call us once you arrive. If you’re coming by train, go to Hakuba station. If by bus, go to Happo bus terminal. Yes. It’s a big parking space and it’s free. Can I rent a car in Japan? Yes. But be sure to get your international drivers license before you leave home. In most countries it’s quite easy and cheap to get one! Below are a couple links to some of the bigger car rental agencies in Japan with some service in English. How can I get money in Hakuba? There are two ATM’s that accept foreign bank cards. One is at 7-11 and is open until 11pm, the other is at the post office down by the station and is open until 7pm. The Japanese banking system is surprisingly behind the times, although this problem seems to get less and less every year. It’s still a good idea to see what your bank at home says about it before you come.